Concert Arias for High Soprano composed by Wolfgang Amadeus Mozart (1756-1791). Edited by Thomas Seedorf and Uwe Kremp. Arranged by Christian Beyer. For soprano voice solo and piano reduction. Stapled. Anthology, Urtext edition. 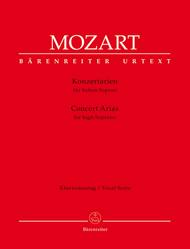 Published by Baerenreiter Verlag (BA.BA9181).